What is the optimal end user experience for a business critical enterprise application, such as Salesforce.com? How does it affect user productivity and what are the business impacts? IT would get complaints about ‘how slow the application’ was but had no means to either quantify the performance degradation or troubleshoot the issue. Riverbed IT, as a pioneer of modern enterprise IT, embracing cloud applications to empower an increasingly hybrid enterprise, has to maintain service level agreements towards internal business units for application performance, but generally has no commitment from our SaaS provider on application performance, other than availability. Today Riverbed uses SteelHead SaaS to optimize workflows from users all the way to SalesForce.com. A SteelHead virtual appliance is spun up on demand on an Akamai point of presence (POP) closest to the SaaS server, and is scaled up with usage to speed up application delivery. The SteelHead SaaS provides a massive improvement to bandwidth consumption (WAN bandwidth reduction of up to 97%) and it speeds up access times to SaaS apps by 33x. 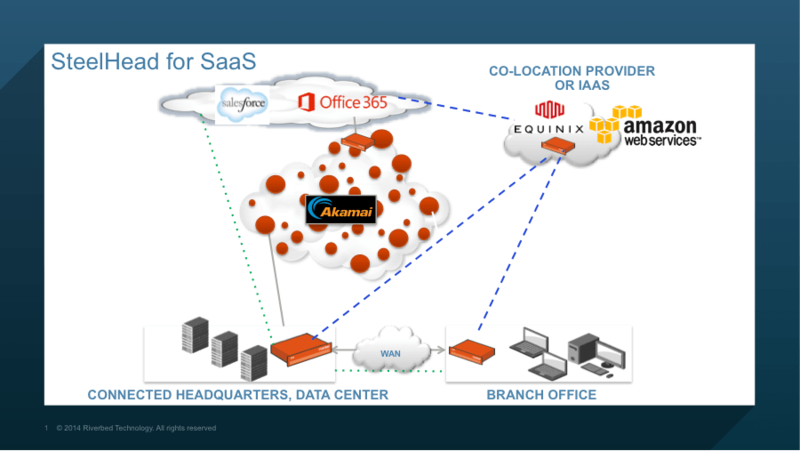 The Salesforce.com performance boost is attributed to a combination of Riverbed WAN optimization technology and Akamai’s SureRoute Internet optimization intelligence. Visibility into Saleforce.com end user experience is made possible by combining SteelHead application intelligence and SteelCentral Web Transaction Analysis (WTA) capabilities. The solution leverages SteelHeads at both the branch office (closest to the end user) and in the data center or cloud (closest to application server) to provide in-depth telemetry information on all http/https traffic. The SteelHead located in the data center is instrumental in providing telemetry closer to the application server for on-premise applications, and SteelHead SaaS is needed for visibility into SaaS applications, such as SalesForce.com. SteelCentral AppResponse collects this telemetry from the branch SteelHeads (this process is called SteelFlow) and Web Transaction Analyzer stitches together individual transactions into a combined ‘page load time’. The result is pretty powerful. Not only does it tell how long it took for each SalesForce.com user at a remote office to perform business transactions such as viewing a report or editing a quote, but also it provides a breakdown of delay components, such as network vs. server time (thanks to the timestamp measurements taken at the SteelHeads closest to branch offices and cloud). So, how does this translate to the needs of the business? CIO and IT leaders are being asked to achieve extra things, with a reduced budget, more quickly. Do more, with less, and at a faster pace than ever before. As a visionary, a CIO has to consult with line-of-business owners to build an IT strategy that enhances business strategy. Speeding up Salesforce.com using Steelhead SaaS aligns with that vision. As pragmatists, IT leaders have to identify the toughest problems facing the operating model and deliver innovation to improve productivity and collaboration companywide. Visibility into how end users experience cloud applications such as Salesforce.com, and where the possible problems are (network vs. SaaS provider vs. custom development by IT) enables open communication across multiple stakeholders for faster resolution. 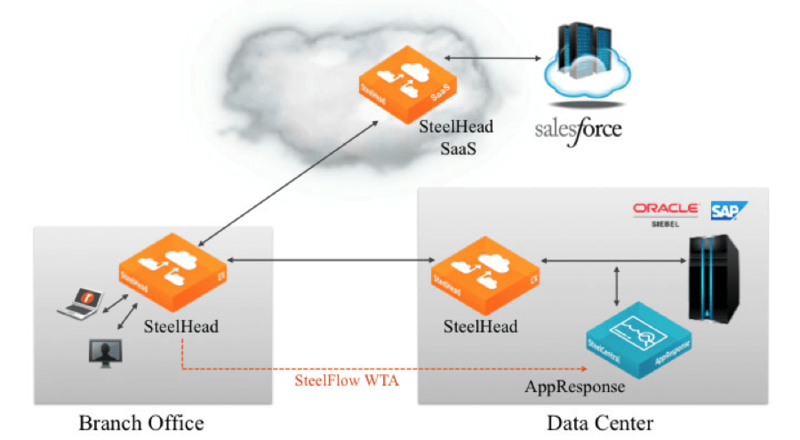 Riverbed’s SteelHead and SteelCentral solutions work together to enable Salesforce.com users to perform at its peak. Learn more about SteelHead 9.0 and SteeelCentral 9.5 integration here.